Tecno has once again added the third itinerary device in their Spark series devices that was started 2 years ago and this time around it is the successor to last year’s Tecno Spark 2 devices and it is the Tecno Spark 3. Although Tecno is planning an official launching event of the new Tecno Spark 3 devices inside this month, but we can categorically tell you that all you need to know about the Tecno Spark 3 have been let out of the bag and we shall be bringing them to you straight away. Like its predecessor, the Tecno Spark 3 comes in 2 variants, the version that comes with 16GB/2GB ROM/RAM that runs out of the box the latest Android 9.0 Pie and the Android 8.1 Oreo Go Edition that features 16GB/1GB ROM/RAM. Both variants feature 6.2inches display with 720 X 1520p resolutions. But while the 2GB RAM variants packs a quad core 2.0GHz MediaTek MT6761 Helio A22 chipset the Go Edition variant features MediaTek MT6580 chipset. The Tecno Spark 3 comes with dual rear cameras; one of the rear cameras is a 13MP shooter, while the 2nd rear camera is 2MP. There is an 8MP front camera for selfie lovers. At the back compartment of the Tecno Spark 3 is sited a non-removable 3500mAh capacity battery with no quick charge technology. Also at the back is a clear fingerprint scanner near the rear camera. It is worthy to note here that none of these 2 variants spot a 4G LTE technology network. 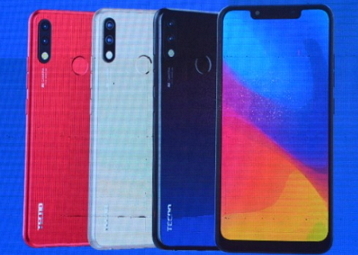 Tecno Spark 3 will be available in four different colours; champagne gold, midnight black, Bordeaux red and aqua blue.